BEETHOVEN Symphony No. 6 "Pastoral"
Toscanini was born in Parma, Emilia-Romagna, and won a scholarship to the local music conservatory, where he studied the cello. He joined the orchestra of an opera company, with which he toured South America in 1886. While presenting Aida in Rio de Janeiro, the orchestra's conductor was booed by the audience and forced to leave the podium. Although he had no conducting experience, Toscanini was persuaded to take up the baton, and led a magnificent performance completely from memory. Thus began his career as a conductor at age 19. Gradually the young musician's reputation as an operatic conductor of unusual authority and skill supplanted his cello career. In the following decade he consolidated his career in Italy, entrusted with the world premieres of Puccini's La Bohème and Leoncavallo's Pagliacci. In 1896, Toscanini conducted his first symphonic concert (works by Schubert, Brahms, Tchaikovsky, and Wagner), in Turin. By 1898 he was resident conductor at La Scala, Milan and remained there until 1908, returning during the 1920s. He took the Scala Orchestra to the United States on a concert tour in 1920-21; it was during that tour that Toscanini made his first recordings (for the Victor Talking Machine Company). 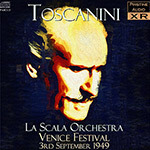 Toscanini returned to Europe from the United States after World War Two on a number of occasions, and conducted the Orchestra of La Scala at a further sixteen concerts between 1946 and 1952, cheifly in Milan, but also twice in Lucerne and once, as presented here, in Venice - the first of three engagements that year with the orchestra. The other two concerts, on 8th and 10th September 1949, consisted of largely the same repertoire as heard on this recording. Neither of these concerts is believed to have been recorded. Original source material: Open-reel tape dub of acetate discs, believed to have been recorded from AM radio broadcast of this concert. Note that the frequency range and dynamic range of the recording has been somewhat limited by the nature of the radio transmission. Some parts of the disc recordings also exhibit quite high noise levels, which I have attempted to control as much as possible.